Let’s face it guys. Color coordination is as foreign to us as Kryptonite is to Superman. Or as chastity is to Paris Hilton. Or as humility is to Donald Sterling. You get the point. Most of us are in severe need of more than just a crash course. 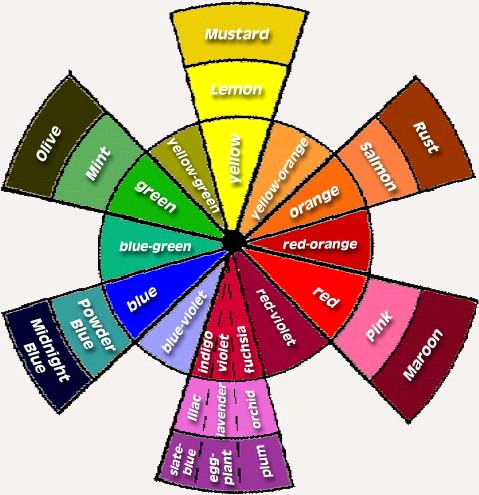 But given that I don’t want to bore you with a book about color the way Lance Armstrong did about ways of legitimately winning a cycling race, here is a quick overview of how we can mix and match colors so that the next time you leave your door, people nod, as opposed to shake, their heads. Upon inspection of a color wheel, we can see twelve main colors ranging from red to violet, to green to yellow, blue and all the way back to red. These are basic colors that can be referred to as hues. Add black or white to any one of these hues, and you can see that the range of colors that one can derive is virtually endless. The trick is in understanding the position of each color on the wheel, because how close or far away they are is what makes them easy or difficult to coordinate. Similar Colors are next to each other, such as blue and blue-violet. When colors are close to each other on the color wheel, this provides a great foundation for picking a main item and building your accessories around it using supporting colors. Keep in mind that knowing the distinction between cool (green, blue, violet) and warm colors (orange, red, yellow), and using that for greatest effect can really make you stand out. While cooler colors generally go together, using two cool colors such as a navy blue suit and a light blue shirt, with an orange or red tie can enhance your overall look by a significant magnitude. Complementary Colors are across from each other on the color wheel, and serve as the greatest contrast. While blue and orange, for example, can seem overpowering to some, when pulled off right, can look absolutely stunning! However, while I would occasionally opt for a blue shirt with an orange tie, green and red are a firm ‘no-no’ in my world. In instances where the color clash appears to be too strong, adding a tint (white) to the color can provide the requisite adjustment needed. For example, adding white to red will yield pink, which would pair well with a green shirt! 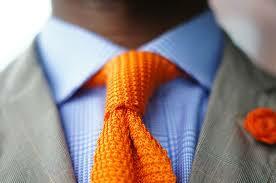 A light blue shirt with an orange tie provides an enhanced look without appearing overwhelming! Contrasting Colors form a triangle on the color wheel. Blue, red and yellow are contrasting colors, as are purple, green and orange. Again, sometimes these color combinations can seem too strong. Donning an orange tie with a green shirt may seem a little outlandish, and so it can be dialed down by having a darker orange (rust) against a lighter green shirt (mint) for added effect, without producing too much of a visual contrast! Neutral Colors. When in doubt, you can always add neutral colors. Neutral colors are a great way to assemble an outfit together without worrying about color coordination too much. Just don’t pair different types of neutrals together. Black, grey and white go together, as down browns, tans and khakis. While white, can pretty much go with anything, I would avoid wearing brown pants and a grey shirt, or vice versa! Monochromatic. If you are looking to avoid adding neutrals, especially when going for a shirt and tie combination, a monochromatic sequence always works. 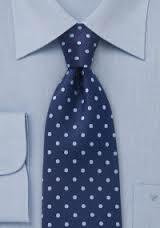 A navy blue tie against a light blue shirt (as long as the tie is darker than the shirt!) will definitely have you looking dapper! When in doubt, a monochromatic sequence is always a safe bet! I wouldn’t mind seeing some examples of how NOT to color coordinate, and other major things to avoid. 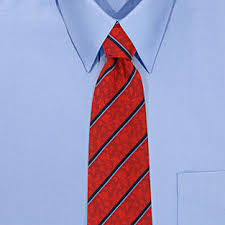 Though I can deduce the obvious myself (that NBA announcer picture you always show), I did not know up until college that you weren’t supposed to match striped shirts with striped ties (although I’ve read varying the sizes and complementing the colors between the two can make this more acceptable). If you could point out some less obvious no-no’s in a follow-up post later on I would appreciate it. Thank you Tad. We are making an attempt to bring more meaningful content covering a diverse range of topics! 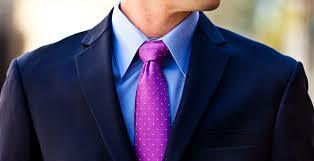 Hope you find our latest articles that also have comments on what Not to do when suiting up, to be helpful! Thank you for your insight!